Peter Van Huffel is a Berlin-based alto saxophonist who many readers might recognize for his work in Gorilla Mask (a high-octane, thrash-jazz outfit) and the Boom Crane trio. Alex Maksymiw is a guitarist who has played with various groups and orchestras, and last year’s Without a Word found him occupying the “leader” role for the second time in his steadily-accelerating career. Although the two have been playing together for around three years, Kronix marks their first recorded meeting - and what a meeting it is! 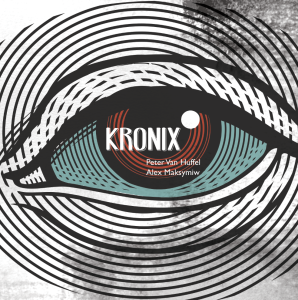 Fans of Gorilla Mask should not expect the same scuffed-up intensity of that group; Kronix is more contemplative, more pensive, but it lacks none of the fire that one can hear in spades on albums like 2014’s Bite My Blues (see the review above). Instead of the uncontrolled, white-hot flames of that record, though, we get a muted glow - the fire has been subdued a bit, left to smolder. “The Charmers” opens with an admittedly charming theme from Van Huffel, free-wheeling and joyous, and accompanied by Maksymiw’s circular slides, up-and-down the fretboard. It’s a lovely way to open the album, but it doesn’t exactly set the tone for the melancholic batch of tunes that follows: “Excerpt Two” finds Van Huffel augmenting a forlorn stream of notes with echo effects, approximating a lone cry in a cave. Of course, he’s not in complete solitude - Maksymiw is there to provide the reverb-laden equivalent of a Greek chorus, mirroring the drama of Van Huffel’s saxophone with his own desolate musings. “Slow Burn” is similar in some ways, but adds an extra dose of, yes, slow-burning tension. “The Dreamer,” a track which originally appeared on Maksymiw’s album of the same name, is here stripped down to its essence, becoming a twilit dirge of sorts. To be sure, it’s not all anxiety and desolation. On “Anyhow,” Maksymiw utilizes distortion to great effect, lending a wild urgency to Van Huffel’s swirling stream of notes. Likewise, “Petrichor” features the same crunching, hard-hitting riffage, but here it’s interspersed with moments of crisp, clean lines and Van Huffel’s terse explorations. “Fuse,” the final standalone composition (there’s an alternate take of “Anyhow” tacked on), sounds just like its name suggests - a tiny spark that swells into a flame, and finally detonates in a cascade of echoes from Van Huffel’s sax. Kronix doesn’t make any grand statements, and it doesn’t break any boundaries, but it doesn’t need to. It’s a concise collection of tunes that is, at times, downright beautiful. Highly recommend to those who like their jazz on the more meditative side - but I’m willing to bet that even fans of the wild, explosive Gorilla Mask will find something to love here.